In the following image, the Ada chat window can be seen on the College's student home page. 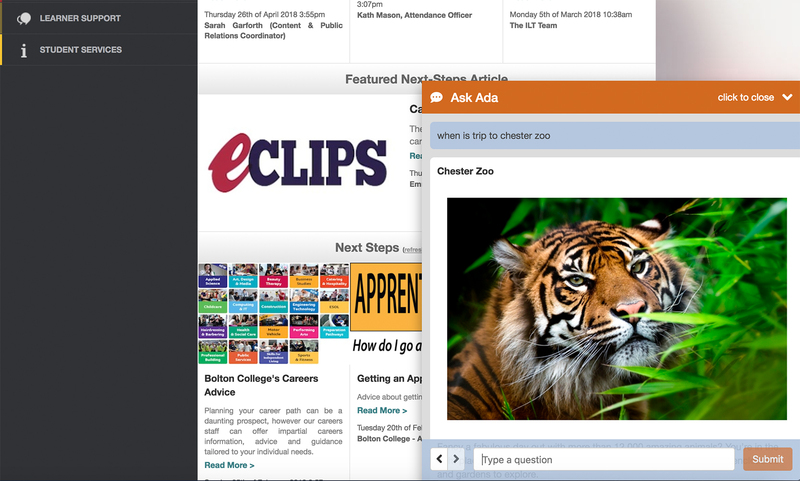 In this example the student asks Ada about a forthcoming visit to Chester Zoo. The Ada service enables the student to ask about the visit without having to open other pages on the student site. The same holds true for numerous other student enquiries. The Ada service has been designed to respond to a broad range of questions relating to the College and life on the campus; students can ask specific questions relating to their studies and subject specific enquiries about the topics covered on a selection of courses. In the following image, the Ada chat window can be seen on the College's work experience app. Students are able to ask Ada a variety of questions relating to their work experience programme; such as where is my work placement, who is my careers coach, how many hours have I logged on the work experience programme and more. The Ada service can also provide advice and guidance to students as they gather their thoughts about the objectives for their work placement or when completing their daily online logbook entries. The development of all futures applications by the College will make use of one or more cognitive services such as Ada. In the following image, the Ada service is presented to students in an online tutorial. Students just have to click on the Ask Ada button to engage with the service. The introduction of the Ask Ada service in our online tutorials enables students to enquire further about any keyword, topic or theme that is covered within a tutorial. In this instance, the Ada service is acting on behalf of the teacher when it supports students away from the classroom. Over time, cognitive services such as Ada will acquire a greater skillset and domain knowledge to better support students when they are not with their teachers. One project that is of particular interest to colleagues on the campus is enabling Ada to support semantic search. For example, a student could ask Ada "Which type of business ownership offers limited liability to the owner of the business?" 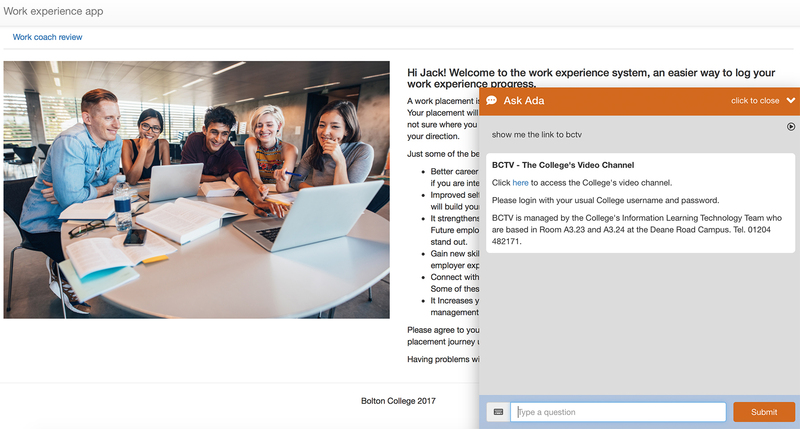 The large and extensive knowledge base within Bolton College's learning management system is well placed to offer an answer to Ada on behalf of the student. If the Ada service is to become truly ubiquitous on the campus, Bolton College will have to deploy the service to mobile. The College is currently developing an Ada iOS app. Colleagues plan to offer students an iOS and Android Ada app in the next academic year. Here is a short demo and overview of Bolton College's Ada iOS app. 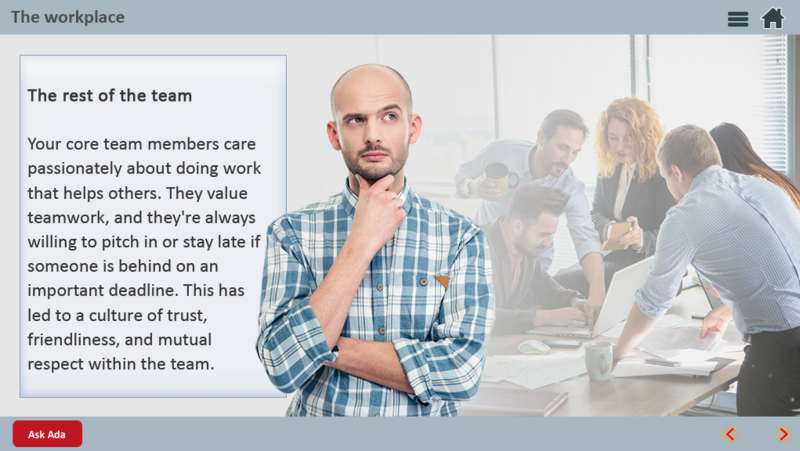 If an institution's chatbot has been designed to support multiple services and transactions; and across multiple devices it will invariably have an impact on how day-to-day services are designed, delivered and managed by the institution. Chatbots will enhance the capabilities and capacity of all individuals and teams on the campus. In a recent discussion that I had with the Careers Advisors at Bolton College about their new CV builder app they stated that robotic process automation and the Ada service would enable them to support every student on the campus with their CVs at a one-to-one level; something that would have been impossible to envisage prior to the introduction of cognitive services onto the campus. The advent of the Ada chatbot on desktop, tablet and mobile means that in the long run every student will have access to a teacher, a tutor, a teaching assistant, a librarian, a careers advisor, a mentor and many more besides on an on-demand basis. A student simply has to pick up his or her phone and talk to Ada to access information, advice and guidance; or to complete a simple transaction that supports their studies; such as handing in an assignment, renewing library books, booking an appointment or applying for the next course.